It’s hard to get into the holiday spirit when your holiday sweater smells like dirty laundry. 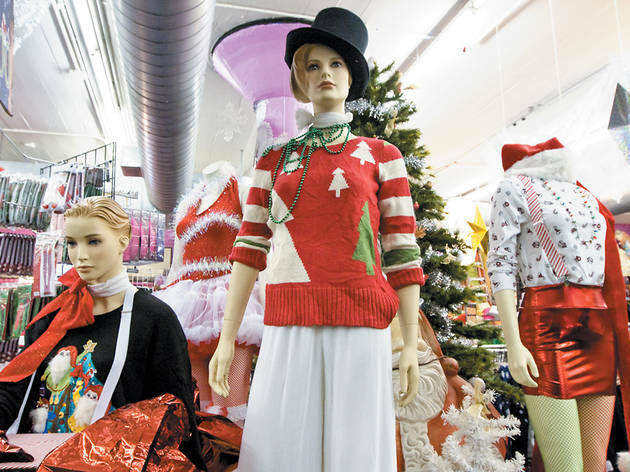 Thrift-store-averse shoppers can head to Kohl’s and find new embroidered cardigans embellished with bells, confetti and reindeer and snowmen knit on sweater vests starting at $26. 2140 N Elston Ave (773-342-9032). Bus: 9. Mon, Tue 8am–10pm; Wed, Thu 7am–11pm; Fri, Sat 7am–midnight; Sun 8am–10pm. In partnership with thesweaterstore.com, this boutique is the heavyweight champ of the ugly-sweater arena. Those who take holiday sweater parties to the extreme will be pleased to find piles of atrocious sweaters—think kittens, penguins, puppies and every other animal covered in sequins and topped off with a Santa hat—ranging from $8 to $75. •812 W Belmont Ave (773-868-9263). Mon–Thu 10am–9pm; Fri, Sat 10am–9pm; Sun noon–8pm. El: Brown, Purple (rush hrs), Red to Belmont. Bus: 77. •1433 N Milwaukee Ave (773-486-1783). El: Blue to Damen. Bus: 56. Mon–Sat 11am–8pm, Sun noon–7pm. 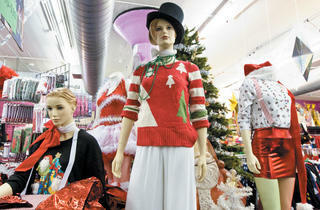 No doubt the stores in your ’hood have a hilarious array of holiday sweaters, but just imagine what you’d find online. Host of the Annual Ugly Sweater Awards, the Ugly Sweater Store is your portal to more than 2,000 sweaters, turtlenecks, vests and sweatshirts. Offerings include a sweater vest with two jolly snowmen framed by a red-and-white checkerboard motif ($24) and embroidered Christmas ornaments on a denim shirt ($5). Oh, yes. You don’t want to spend too much money when it comes to ugly holiday sweater shopping. Hit up any Unique Thrift Store and prepare to dig through racks of questionable sweaters for as little as a few bucks. Pick a different one for every ugly sweater holiday party you’re attending this season—should you be so lucky to have received multiple invites. Just make sure to save a little change for dry cleaning. Locations around the city.